Alex Vause is an inmate at Litchfield Penitentiary and on and off again lover of the main character Piper Chapman in the show Orange is the New Black. She is portrayed by Laura Prepon. Alex is a former drug smuggler for a drug cartel and took a sexual interest in Piper after meeting in a bar. 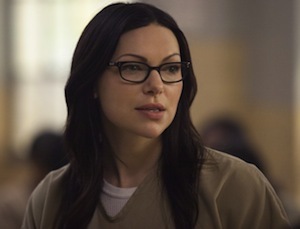 Vause once convinced Piper to smuggle drugs and for which she is doing time after Vause named her during her testimony. 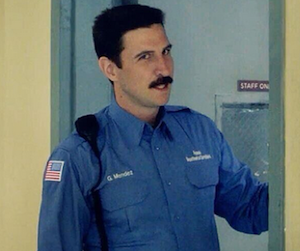 They meet in prison, it was awkward at first but they eventually started an affair. Alex is a tall athletic woman. She has dark black hair, usually wearing dark eye liner, and wears glasses with thick black frames. 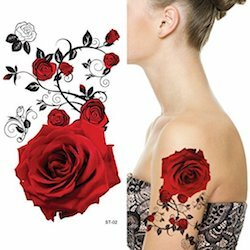 She especially loves showing off her rose tattoo on her arm. 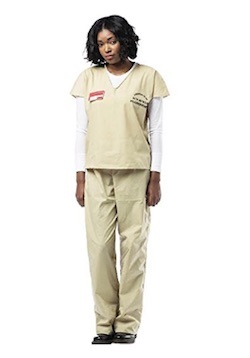 Below are Alex Vause costume ideas to help you look like Alex Vause from the show Orange is the New Black. Perhaps you and your friend can dress up together and go as a couple. One can be Alex and the other can be Piper. 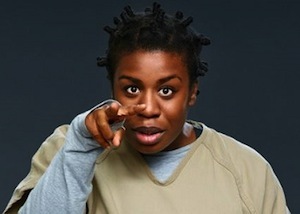 Click here for more Orange is the New Black costume ideas.